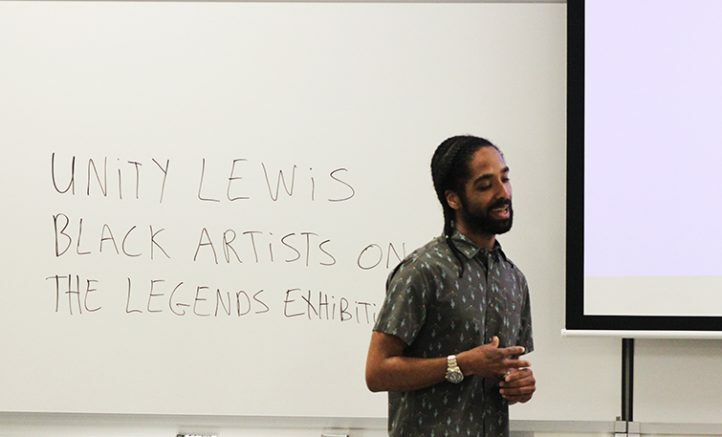 That’s the idea that art instructor Unity Lewis stressed during a lecture held March 15 at American River College, across from the Kaneko Gallery where “Black Artists on Art: The Legends Exhibit” was on display. The exhibit comes from the book series “Black Artists on Art,” a collection of drawings, paintings, journals, and other art collected from black artists around the world during the mid 1900’s. Unity’s grandmother, Dr. Samella Lewis came up with the idea for the book after observing several black artists left out of the spotlight during the period of racial segregation in the 20th century. Samella Lewis was the leading black art historian in the country and even wrote the first comprehensive textbook on black art. The first prominent display of black art came from the Oakland Museum and it was that show which inspired her to create the first two volumes of the series. Some artists that Samella Lewis has worked with and were featured in the first book included names such as Jacob Lawrence, Ruth Waddy, Elizabeth Catlett, Bernie Casey, and more. Lewis said that the creation of such a series was to make a statement and provide a platform for black artists. “I was using art as an instrument to make a statement about cultural situations and situations that were really bad for black people at that time. It was absolutely necessary,” Lewis said. Samella also said that most of artists’ influence now came from black art. “Most of what the white artists were doing started from what black artists had been doing,” Samella said. Unity picked up the series where his grandmother left off, and is looking for new artists to create a third and fourth volume of the book. He said he has not been short of people who want in. Notable artists applying for a spot in the book include Hank Willis Thomas, Nicole Dixon, and the lead singer of P-Funk, George Clinton. “First I approached him on a music standpoint and did a bunch of stuff with him musically, but his trade with me was ‘Hey, I’m trying to get known as a visual artist,’” Unity said. “It’s important for all cultures to have records of their cultural history. That’s a requirement,” Clinton said. It was also their first taste of exposure to the press and it even earned them a Certificate of Recognition from Congresswoman Barbara Lee. The exposure led to more shows and exhibits before the project took a hiatus in 2016 due to personal matters and prior obligations, before making its appearance at Joyce Gordon Gallery in Oakland and Kaneko. “Now that we have this exhibit thing down, we want to book some more touring dates, we want to expose people to the whole ‘Black Artists on Art’ legacy in the original books, but also to keep building our artist network, which we currently have about 500 artists,” Unity said. Unity added they were looking at expanding their reach beyond books and were looking for an editor and publisher among other positions. But the ultimate goal remains the same for the project. “To unite the black art community and also to give that art that we create to the world,” Unity said. Be the first to comment on "Artist Unity Lewis preserves black art"